Private jet travel is just for celebrities, right? Wrong. While it used to be for the elite and famous, it’s now becoming a feasible option for first-class and frequent business travelers. Years ago, flying on a private jet was a luxury. You either had to invest in an ownership plan, reserve your own aircraft through a broker, or shell out thousands in membership fees. Now, with last-minute deals on unused seats and targeting business and first-class travelers, private jet travel has changed significantly over the past several years — making it affordable to those who’d like to pass security lines, save time and fly in luxury. So, sit back, relax and discover how private jet travel isn’t that far out of reach. The new accessibility of private jet travel is due to a lot of things including a decrease in price, easier booking processes, and the single-seat booking model—the combination of private aviation and commercial air travel. Now, you can book single seats rather than entire planes. The decrease in costs is largely due to next-day deals that hope to fill seats which would have otherwise remained empty. So when you need a seat, we have seats that we want filled — creating a win-win opportunity for all parties involved. And while flying business class or through a discount airline seems appealing at first, there are still hidden fees and charges that aren’t reflected in the advertised ticket price. Checking a bag can cost anywhere from $25–$50 for each flight, and perks during a flight may not even be included — so snacks, drinks and Wi-Fi can still be out-of-pocket expenses that quickly add up. Some airlines will even charge you to check a bag each flight, adding around $100 to a round-trip flight. But with private jet companies like Mountain Aviation, Wi-Fi and checked bags are always free. Transportation to and from a commercial airport is not only another added expense, but also an inconvenience. If you’re driving yourself to the airport, parking fees can significantly add up, while traffic and crowded parking lots may prevent you from reaching your gate in time for your flight. When traveling with a private airline, lots and traffic aren’t an issue, and parking remains free. And if you’re traveling alone, you can get an empty leg seat for almost 75% cheaper than flying commercially. When comparing private jet travel to commercial airlines, it’s hard to not come up with an endless list of benefits. With private jet charter, you don’t have to deal with busy airports and long security lines. Instead, you get quiet and clean terminals, easy-to-reach airports, reliable departure and arrival times, comfortable seats (with room to lounge) and minimal-to-no security lines. You’re also able to drive right up to the terminal and not worry about taking a shuttle or walking half of a mile across the airport to get to your flight’s gate. And as if it didn’t already sound appealing, pets are also welcomed, and there’s no rushing to the airport to get there two hours before boarding time. 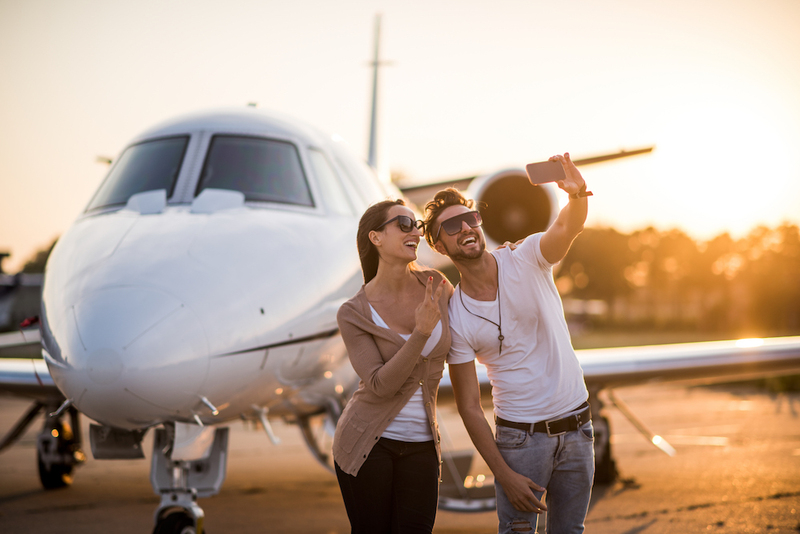 With private jet charter, you may be able to show up around 30 minutes before departure. At Mountain Aviation, we consider all of the details of your trip. If you have a business meeting at 1 pm, we’ll let you know what your departure time should be based on your itinerary, along with coordinating transportation to get you to your destination. You can even make requests for food and drinks to enjoy during your flight. There are also numerous benefits for businesses that require employees to frequently travel. By flying with Mountain Aviation, businesses can save money (and time) by skipping overnight accommodation fees in addition to cancellation fees and delays — and no one has to worry about missing a meeting or business opportunity. Finding the most affordable trips on a private jet is tricky, but it’s doable. Having travel dates that are flexible is key, as empty leg seats can open at the last minute. It’s beneficial to be willing to book a flight at the last minute to jump on next-day deals. Don’t know which private airline to check out first? Try Mountain Aviation. Serving the Denver, Aspen, Eagle, Boise, Fort Collins and Grand Junction areas, you can go to popular destinations like Tacoma, Savannah, Santa Ana, Jacksonville, Oakland, Telluride and more.